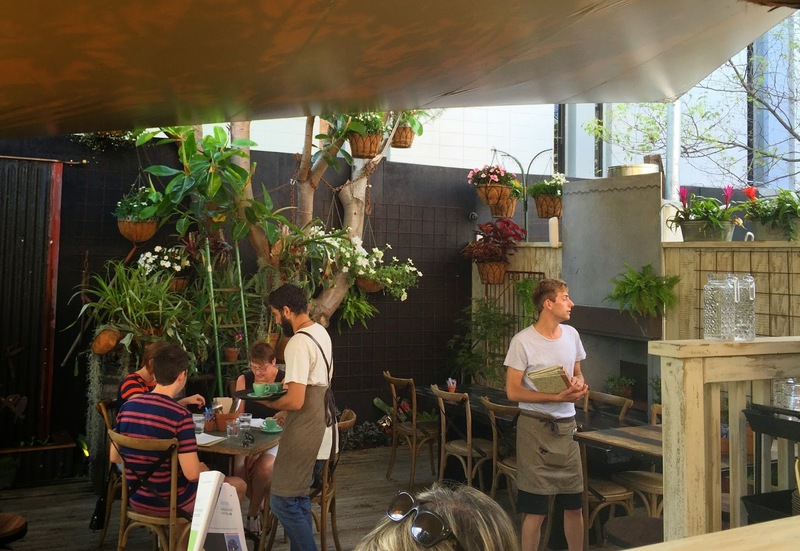 We came here because we were looking for brunch in Mount Eden, and The Garden Shed had newly opened where Thai Eden used to be. The menu was in a hardcover, fabric-covered ring binder, using all the right phrases like "sourced fresh from local suppliers", "higher welfare meats" and "organic milk". The "fine bistro fare" on offer was divided into multiple menus: Share with Friends, Weekend Brunch, Lunch, Mains and Dessert. These listed a large variety of food, from fried snacks like deep-fried ham and gruyere sandwiches, to brunch options with eggs, pancakes, etc., to wild boar dogs to chicken schnitzel to home made pansotti. There were also plenty of drink options, as this place also has a bar at the front. The setting was bright, airy and garden-themed, with a large courtyard out the back with a water feature trickling down corrugated iron. Every table had fresh flowers, and there were hanging pot plants, pitchforks and plenty of wooden fittings. It was also beautifully smoke-free, including in the outdoor area. The service was very good even though the wait staff all seemed very young. Water was topped up periodically. Buckwheat Pancakes with maple roasted stonefruit and Whitestone butter ($16.90) - this was delicious, but came with too much syrup and too little butter. We ordered extra bacon and were disappointed with how little there was, but we were charged only an extra $3.50, rather than the $5.90 printed in the menu. Buckwheat pancakes with added bacon. Garden Breakfast with soft poached eggs, topped with crispy quinoa and garden herbs with sugar snaps, oven roasted tomatoes and toasted sourdough ($16.90) - this had good flavours, and felt light and vibrant. If you are used to a large breakfast, you might need to order something else to supplement it though. Overall, this was a great place for a summer brunch, with an emphasis on quality over quantity. The food was well presented and skilfully cooked. We weren't sure about the garden theme initially, but they have made it work, and there were plenty of other customers from a range of age groups. The Garden Shed from the street.